Side dish: Since everyone’s going on about Hong Do’s pumpkin porridge, let’s see how good it really is. Here’s a recipe from Beyond Kimchee to get you started. Severe anthrophobe, Cha Hong Do (Choi Kang Hee) runs away from her policeman crush, Jang Doo Soo (Lee Jae Yoon) in slow motion. But, that is the future, and back in the present, misanthrope psychiatrist, Ko Yi Seok (Chun Jung Myung) is hanging from a tie due to a mistaken suicide attempt. Hong Do arrives on the scene, and after some fumbling, manages to cut him down. Instead of thanking her, Yi Seok angrily replays the phone message from Doo Soo, explaining that his patient had confessed to hurting himself, thus clearing Yi Seok of any responsibility. When Hong Do’s phone (which has ended up in his pocket) rings, Yi Seok picks it up, and yells at Doo Soo for accusing him in the first place. With Hong Do’s phone still in his pocket, Yi Seok drives to the hospital to confront his patient. But, in the patient’s hospital room, Yi Seok starts experiencing tinnitus and dizziness again. For some reason, his symptoms are only mitigated by the presence of Hong Do, who followed him to retrieve her phone. Finally, Yi Seok promises to fix Hong Do’s illness if she spends the next three minutes with him, and drags her into the patient’s room. When he asks his patient why he tried to commit suicide at his office, the patient instead demands that Yi Seok stay away from his daughter. 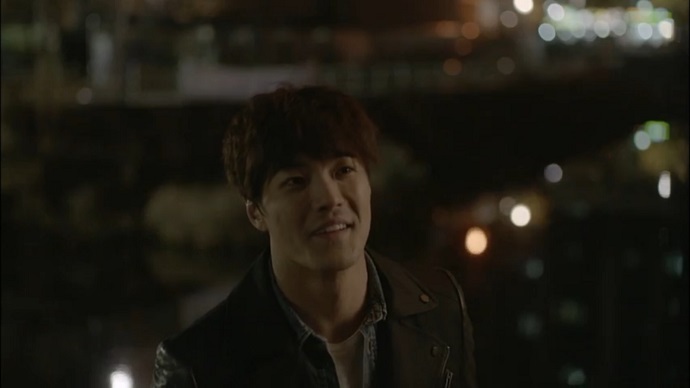 Confused and ill again, Yi Seok leaves, tossing Hong Do’s phone at her on his way out. The next day, Hong Do transforms herself into Young Rae, the grandma persona she uses to go to work. She goes over to the Chairman’s house, where he summarily dismisses her before she even comes in. After Young Rae persuades him, he lets her stay, but not before she discovers that Yi Seok is the Chairman’s grandson. Yi Seok, for his part, is having his drunken bender interrupted by a phone call from his mother, Hwang Moon Sun (Jin Hee Kyung) who reminds him of the Chairman’s birthday. He hangs up on her, and goes back to blaming himself for his patient’s suicide attempt. Back at the house, Young Rae busily types as the Chairman dictates. Regardless, he dismisses her again without looking at her work. As she leaves, Young Rae spots Yi Seok and his mother coming back from shopping. Doo Soo and his partner eat pumpkin porridge at the convenience store. As Doo Soo types out a message to Hong Do, a naked woman goes running by. The two of them drop everything to go chasing after her. Back at the house, Hong Do agonizes over the half-finished message from Doo Soo, while Doo Soo and his partner chase the naked woman on to a film set, where Yi Seok’s sister, Ko Se Ro (Ahn So Hee) is an extra. Se Ro tries desperately to insert herself into the scene, but the entire filming is ruined by the arrival of the naked woman, followed by Doo Soo and his partner. Yi Seok arrives at the office of psychiatrist Uhm Gi Choon (Seo Yi Sook), who informs him that his drinking on the job is going to lead to the closure of his practice. When she asks why he started drinking, he avoids the question. Hong Do crouches in the bushes around Doo Soo’s apartment, wondering if his half-finished text meant that he’d like to meet for a meal. She imagines herself and Doo Soo dancing together romantically, though she can’t picture anything more than their feet. When he finally responds and invites her for a meal, she imagines herself dancing around the street with happiness, but in fact, she’s still in the bushes, giggling into her helmet. On the day of the date, Hong Do agonizes over her clothes, and finally picks the outfit we first saw her running down the street in. Things start to go wrong from the start, when the taxi she reserves can’t come to her front door. Hong Do runs to the taxi with the help of an umbrella. During the ride, the taxi driver asks her to answer the ringing phone that another customer left behind. Hong Do desperately ignores him so when the driver is forced to answer the phone, he ends up getting pulled over by the police. Rather than be forced to interact with the police, she throws some money at the driver, and flees. Hong Do runs as the taxi driver chases her for the rest of the fare. Meanwhile, at the restaurant, while waiting for Hong Do, Doo Soo spots a suspect from another case. Doo Soo takes off after him. Thus, we return to the opening scene. Though both Doo Soo and Hong Do are running, it turns out to be for separate reasons. It’s dark when Hong Do finally makes it to the restaurant. Having caught the perp, Doo Soo arrives shortly after her, but the restaurant is closed, and Hong Do’s courage has failed her. Doo Soo calls her phone, only to discover that she dropped it in her frantic run. Hong Do stares pitifully after him, as Doo Soo leaves to retrieve her phone. Miserable, Hong Do goes home and gets drunk, but Doo Soo shows up shortly afterwards with her phone. She hides in the dark, crying, as he stands outside, and apologizes for leaving the date, then asks if he can treat her again sometime. That night, at the Chairman’s birthday celebration with Se Ro, Moon Sun, the housekeeper and the butler, the Chairman questions Yi Seok about his drinking while treating a patient. The Chairman then sets his sights on Se Ro for failing at being an actress, and Moon Sun for drinking too much. When Yi Seok’s prodigal father shows up, Moon Sun has a full-on panic attack, and ends up bedridden. 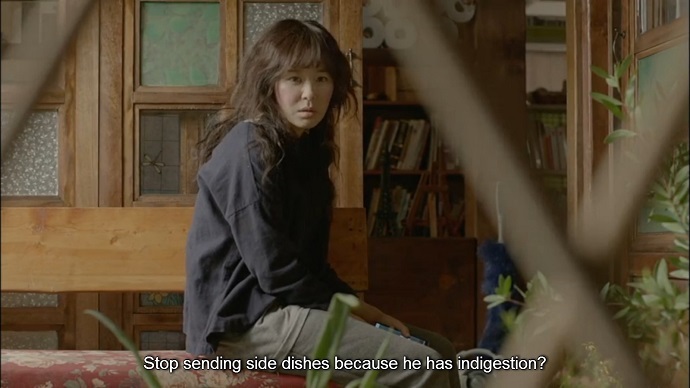 When Yi Seok goes to complain to Gi Choon, he finds out that she has been made responsible for him, as a condition of his continuing to practice as a psychiatrist. She tells him that he has to stop drinking and work in her clinic. Gi Choon challenges Yi Seok on whether he’s ever had any empathy with his patients. The next day, Hong Do goes to see Yi Seok, and finds his office in shambles. He accuses her of stealing, on sight, but she takes off her helmet to show him her spectacularly red face, and begs him in tears to help her. 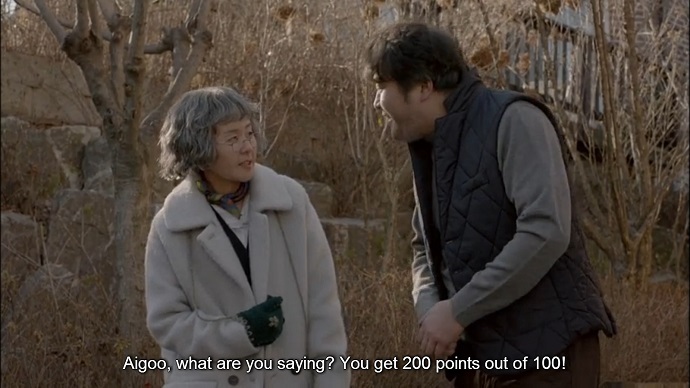 On a side note, I can’t believe the Chairman’s kindly butler is played by Choi Moo Sung, the actor who played the scary Safari in “Heartless City”. Back to the point, for what was billed as a romantic comedy, “Heart to Heart” has thus far been neither romantic nor terribly comedic. And, aside from the blandly heroic Doo Soo, it’s hard to like any of the characters (another side note: does Lee Jae Yoon have bad hair on every show?). That said, I remain optimistic; the pacing is good, and character likeability is not the barometer by which I judge a show. While it’s hard not to expect a lot from the director who brought us “Coffee Prince”, I can’t blame “Heart to Heart” for going against my expectations. While the show is a lot heavier than I thought it would be, what with Hong Do’s severe social anxiety, and Yi Seok’s myriad problems, the director’s deft, light-hearted touch is still evident, and that’s good news for a show that still has a lot of time to grow. Anyway, from what I’ve seen so far, it’s promising enough to keep me watching next week.